One can not have enough of this wonderful mixture, which rejuvenates the earth and soil in a very short. 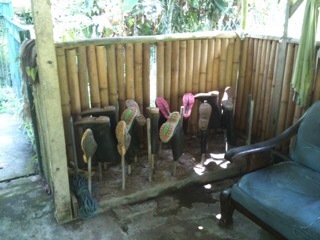 At #JiwaDamai we use #organic #compost only. 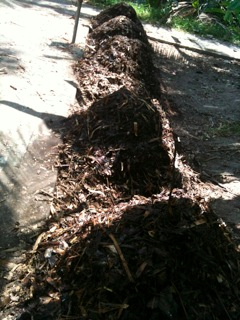 In this case we applied the 18 day Berkeley method of compost making and made 6 nice compost heaps. Layers of leaves, dried grass, some nitrogen carrying plants, small branches, some ashes from our burnt coconut shells as well as some of our own grown IMO (individual micro organisms). The whole team participated to put it together as well as our wonderful volunteers. After the first 4 days we turned the heaps for the first time, and already quite a lot of heat had developed. The inner was turned outer and the outer became the inner. After this we turned it very two days. It is incredible to see how all the ingredients mix and fuse more or less into one consistency. The pictures you see is day 16 and two more days to go before it will be ready to use. Have your heard about #compost tea? 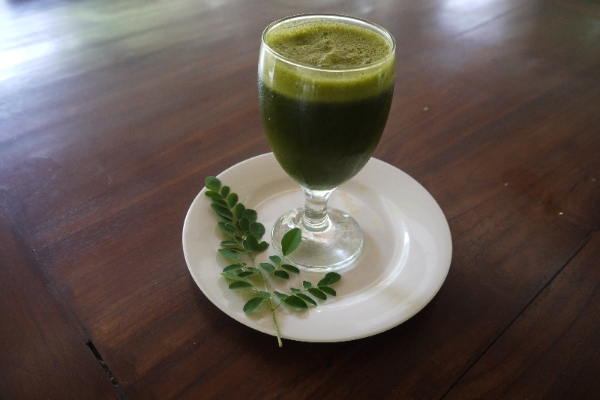 It’s a concoction that is supposed to supercharge your garden. Does it work? I don’t know and I don’t think anyone can say so definitively. Let me explain why. Recipes for compost tea have been around for a couple of thousand years, but it fell into disuse. Fortunately, we’re experimenting with it again. Trying to figure out how best to make it and how best to use it. Compost tea is not that complicated to make. It’s simply a liquid soil additive that’s made from steeped compost. Here’s some DIY instructions on how to make an aerated compost tea (via the Pennsylvania EPA). It’s also possible to make an anaerobic version. Basic equipment. Start with a 5 gallon bucket, a gallon of mature compost, and a cheesecloth. To aerate it, get an inexpensive aquarium pump, some pump tubing (you can cut it into the lengths you need), and a gang valve (to divide the air supply into several streams). Put about four gallons of water into the bucket. If you are using tap water, make sure you remove the chlorine before you add the compost to the mixture. How? Let it sit in the bucket overnight or bubble air through it for an hour or so. The chlorine will evaporate. Don’t overfill the bucket. Leave four to six inches of space for bubbles to pop. If you want to accelerate the process add some unsulphured molasses to the mixture. Turn on the air pump and let it run for 2-3 days. When ready, strain it with a cheesecloth. It should smell earthy. If not, discard it. 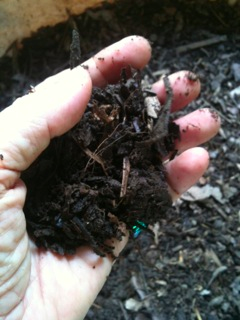 Return solids to the compost pile. Finally (below), put it to use. So why would you go through the trouble to produce compost tea? On a basic level, compost tea makes the nutrients in the compost more accessible to your plants. In this way, it serves the role of a weak, organic fertilizer that you can apply routinely. That’s useful. The advanced reason is that it is a way to speed up the development of beneficial organisms in your garden. Why? Compost tea is supposed to create a super-colony of bacteria and other organisms that can rapidly set up shop in your soil, to support your plants. Sounds great in concept, however, there’s a problem. We know almost nothing about the complex web of microorganisms in the soil and in our bodies. It’s very big and very complex system: a healthy human body is the host of a 100 trillion strong bacteria ecosystem that supports and protects us in ways we’re just beginning to learn about. As a result, it’s going to take some time to figure out. Professor Teruo Higa, who recognized and developed the use of EM, since its inception has seen growing its philosophy throughout the world. EM is the abbreviation for Effective #Micro-Organisms. EM is a combination of useful regenerated micro-organisms that exist freely in nature and are not manipulated in any way. This mixture increases the natural resistance of soil, plants, water, humans, and animals. EM considerably improves the quality and #fertility of soil as well as the growth and quality of crops. • In personal bodily hygiene and for the prevention and treatment of health problems. EM consists of many different kinds of effective, disease-suppressing micro-organisms. Each of these effective micro-organisms has a specific task. In addition, these micro-organisms enhance each others working. This means that synergy occurs! The micro-organisms are naturally existing and are not modified or manipulated in any way and are cultured according to a specific method. Some of which are known to produce bioactive substances such as vitamins, hormones, enzymes, antioxidants and antibiotics that can directly, or indirectly enhance plant growth and protection. • #Lactic acid bacteria: these bacteria are differentiated by their powerful sterilizing properties. They suppress harmful micro-organisms and encourage quick breakdown of organic substances. In addition, they can suppress the reproduction of Fusarium, a harmful fungus. • #Yeasts: these manufacture anti-microbial and useful substances for plant growth. Their metabolites are food for other bacteria such as the lactic acid and actinomycete groups. • #Actinomycetes: these suppress harmful fungi and bacteria and can live together with photosynthetic bacteria. • #Photosynthetic bacteria: these bacteria play the leading role in the activity of EM. They synthesize useful substances from secretions of roots, organic matter and/or harmful gases (e.g. hydrogen sulphide) by using sunlight and the heat of soil as sources of energy. They contribute to a better use of sunlight or, in other words, better photosynthesis. The metabolites developed by these micro-organisms are directly absorbed into plants. In addition, these bacteria increase the number of other bacteria and act as nitrogen binders. • #Fungi that bring about fermentation these break down the organic substances quickly. This suppresses smell and prevents damage that could be caused by harmful insects. Effective Microorganisms, or EM is one of the most popular microbial technologies being used worldwide now and EM products have been on the market since 1983 in Japan. EM comes in a liquid form and consists of naturally-occurring beneficial microorganisms. Throughout the world, EM applications are made in the farming, livestock, environmental clean-up (polluted waterways, lakes and lagoons), and health industries. What EM is not, is harmful, pathogenic, genetically-engineered/modified (GMO), nor chemically-synthesized. Neither is EM a drug or fertilizer. Here at #JiwaDamai we are creating our own #microorganisms. A #bamboo is split in half ad filled with cooked rice. Then it is closed, but not too tightly, and buried close to growing bamboo. After 10 days it is dug out and opened. One can see the fine fungus which has grown and represents the organisms. Now sugar and water are added, covered and placed in a dark place with water to grow and multiply. After five days the brew is ready to be distributed in the garden. It should have a nice earthy smell. 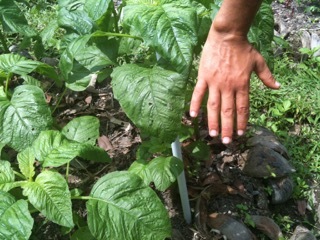 This brew nourishes the roots and can be sprayed on the leaves as well. This new concoction is becoming increasingly popular among farmers. Usually called indigenous microorganisms (IMO), this concoction has been successfully tried by government agriculturists, academic researchers and non-profit foundations alike. They have found it useful in removing bad odors from animal wastes, hastening composting, and contributing to crops’ general health. 1. Cook a kilo of rice, preferably organic. After cooling, put the cooked rice in a bamboo, wooden, earthen or ceramic container. Avoid plastic or aluminum. 2. Cover the mouth of the container completely with cloth or paper, fixed in place with a rubber band, to prevent water or small insects from getting in. 3. Put the covered container, protected from possible rain, under the trees, in a bamboo grove, a forest floor, or wherever a thick mat of leaves has formed. Leave it there for three days. 4. After whitish moldy filaments have formed, transfer the entire contents of the container to a larger glass or earthen jar and add one kilo of brown sugar or molasses, preferably organic. 5. Cover the jar with clean cloth or paper, fixed with a rubber band. Keep the jar in a dark, cool place. Let it ferment for seven days, until it appears muddy. This is your IMO concoction. To use, mix two spoonfuls of the concoction with a liter of water. Spray the diluted solution around chicken coops and pig pens to remove unpleasant odors, on your compost pile to hasten decomposition, or on your crops to improve their general health by controlling pests and serving as folia fertilizer. 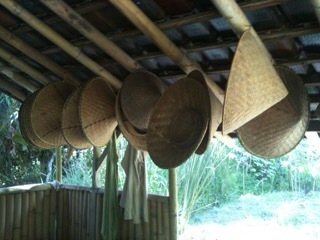 By making their own IMO, farmers can free themselves from the need to buy inputs for their farms. By reducing their costs, using IMO keeps them away from debt and improves their income. Another one of our much used #natural #fertilizer is the compost tea. Our very fine compost is placed in a bucket with water and oxygenated and aerated with a small pump for 26 hours. After which the tea is sprayed on plants and earth. 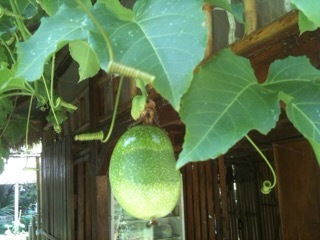 Passion fruit and pineapples are looking beautiful. 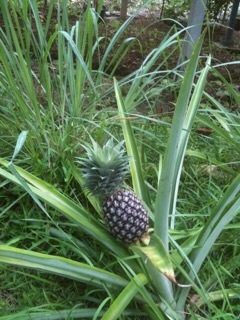 Jiwa Damai has about 100 pineapple plants which come to fruition at different times. Once the pineapple is eaten its green top cut of, this top will be right away replanted and a new pineapple will grow there. 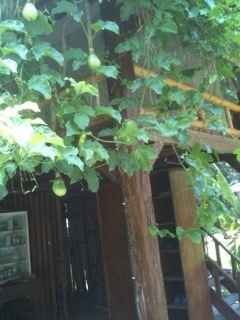 Passionfruit is a beautiful vine which has by now covered our wooden Lumbung in the garden and give is it a very enchanted touch. The fruit is slightly accede and very refreshing.